Last Autumn I covered half of my allotment’s raised beds with regular horse manure, it was about three inches deep. 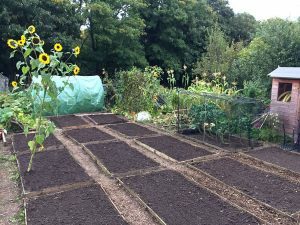 We get free manure deliveries to our allotment site and it did a marvellous job of keeping the weeds down over the winter – it’s a form of ‘no-dig’ gardening. The crops that I grew in the various raised beds this year produced bumper crops but I was prevented from growing root crops (because the fertility can be too high if recently manured resulting in ‘funny veg’ syndrome). Consequently this winter I’ve gone with a green manure solution which involves sowing in mid to late September (October at a push). By ‘green manure’ we don’t mean manure from a very poorly horse… we mean that we sow a cover crop in a bed (or beds) with the sole purpose of letting it grow before we cut it down and turn or rotovate it into the soil (without harvesting any produce from it). Think of it as a sacrificial crop used to improve your soil – it sounds a bit bonkers but there are many reasons why we do it. 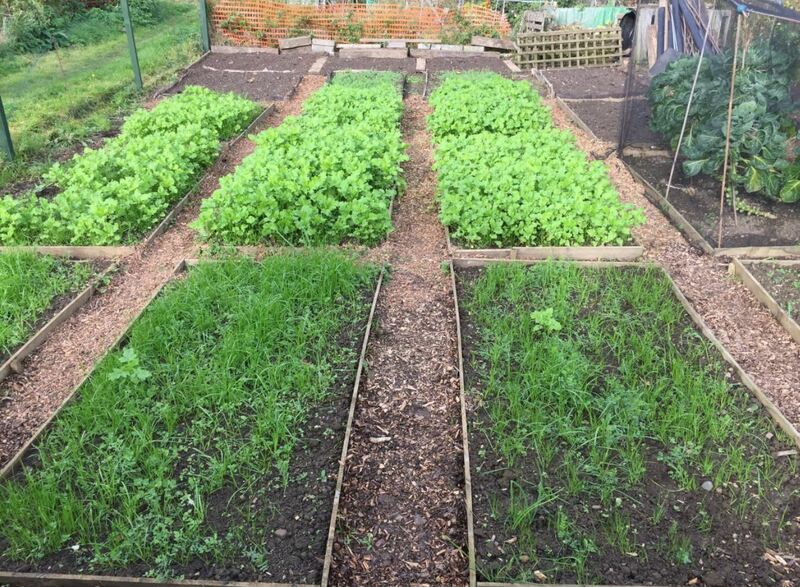 An Autumn sowing of green manure will see plants grow throughout the winter before they are cut back and turned into the soil the following spring. Some green manure crops can fix nitrogen and key soil nutrients into the soil so that they don’t leach out of the soil over the cold rainy autumn and winter months. Empty beds will leach nutrients. Other green manure crops can bring up nitrogen and minerals from deep in the soil into the plant foliage, which when cut back and rotovated, adds them into the soil for Spring planting. Green manure crops restrict weed growth, empty beds are likely to be overtaken by unwanted weeds which will draw nutrients from the soil and be a nuisance to remove the following year. Many green manure crops can help to break up heavy clay soil, those crops with a long tap root help to split large clumps of clay, making the soil easier to manage and cultivate. 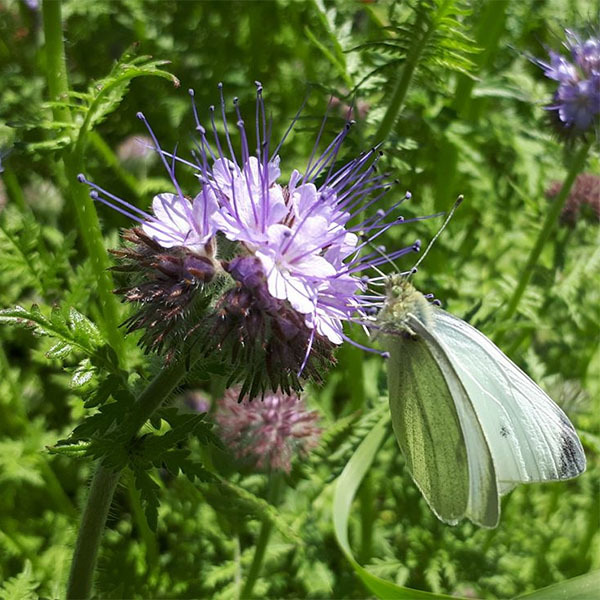 A green manure crop may provide an environment for slugs and snails to breed in, which could increase their numbers (but then again so could weeds!). 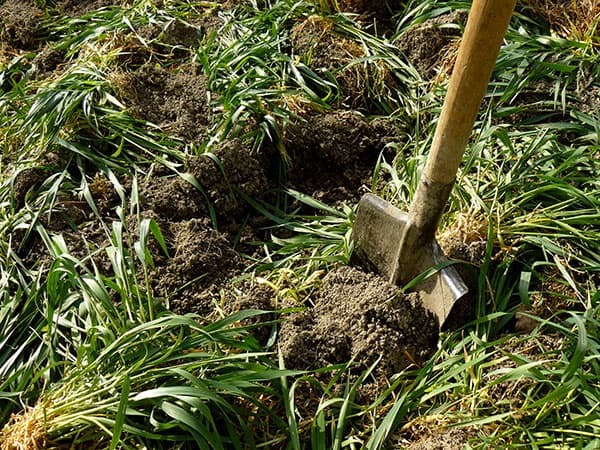 You have to allow up to four weeks after cutting back and rotovating the green manure crops before sowing a new crop. This is because some crops are allelopathic which means they naturally leave toxic substances in the soil to restrict the germination of other new crops. (NOTE. Coffee grounds also do this because of the caffeine!). Some varieties of mustard are commonly sold as green manure cover crops. Mustard is a brassica so if you are planning to grow cabbages, broccoli or cauliflowers in a bed it should not have been recently used to grow a mustard cover crop. Italian / Hungarian Grazing Rye – a nitrogen and mineral LIFTER that also works well as a soil structure improver. Can be left to grow for up to two years before cutting (if you feel like a year off at the allotment!). 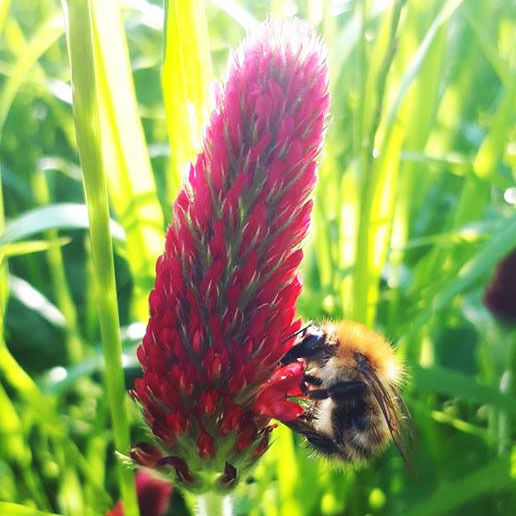 Red / Crimson Clover / Trifolium incarnatum – a nitrogen FIXER that also works well as a soil structure improver and is an excellent weed suppressant. Forage Pea – a legume which is again a nitrogen FIXER and improves soil structure with its deep root system. White Mustard (Sinapsis alba) – a fast growing brassica which covers the ground in just over one month. Mustard plants can ‘cleanse’ the soil of pathogens because they contain high levels of glucosinolates. Phacelia tanacetifolia – a weed suppressant and soil improver, also a good food source for pollinators. I don’t sow beans or peas as a cover crop on my allotment because we get a lot of pheasants at our site and they will destroy the shoots unless netted (and that isn’t practical for large areas). Pigeons can also be just as much of a nuisance so do factor in possible bird damage during colder months when other food sources are less available to birds. As a consequence I tend to go more for the Rye, Mustard and Clover based green manure mixes. As you can see (right) I have already begun to turn over the finished summer beds and sown some seeds already. It is important not to leave this too late because cold soil may restrict the germination of the green manure crops, leaving your soil exposed to the elements. I’ve also sown a mixture with added Phacelia tanacetifolia ‘Lacy Phacelia’ – I’m not entirely sure that will overwinter as it’s not very hardy but I thought I’d give it a whirl. Other mixes I’ve purchased in the past include those available from Pennard Plants priced at £3 for 22 sqm of coverage per pack. 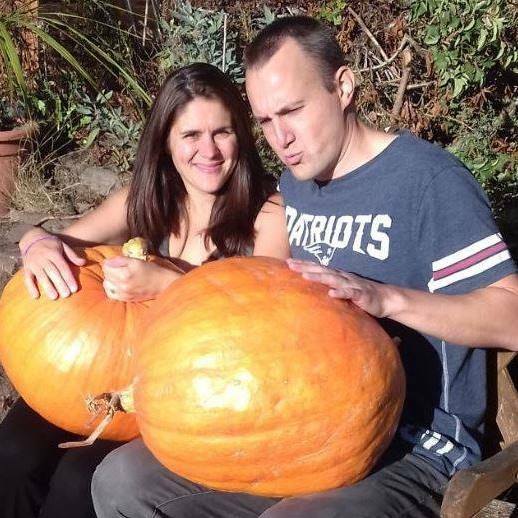 Pennards are a family run nursery which specialises in natural growing methods and heritage seeds. I have bought squash seeds and garlic bulbs from them for the past two years with much success. Seeds are also available from Thompson & Morgan who sell Crimson Clover and Grazing Rye at £2.99 per packet. 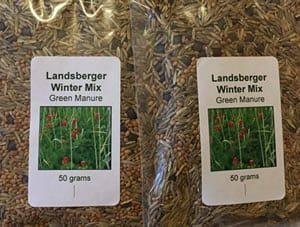 Of the Seedaholic green manure seed mixes listed in the bullets above I found that the Landsberger mix grew best on my clay soil, the green manure winter mix is performing more slowly and the ‘Tares & Rye’ mix is growing least well. The Landsberger mix is growing in the middleground below, all sown around six weeks ago. I have just sown some more in the beds at the far end of the plot but cold weather is upon us so it may not germinate well. Green manures are something I need to get better at. I keep thinking of having an Alfalfa patch to produce stuff I can either mulch with or compost, much like I do with comfrey.